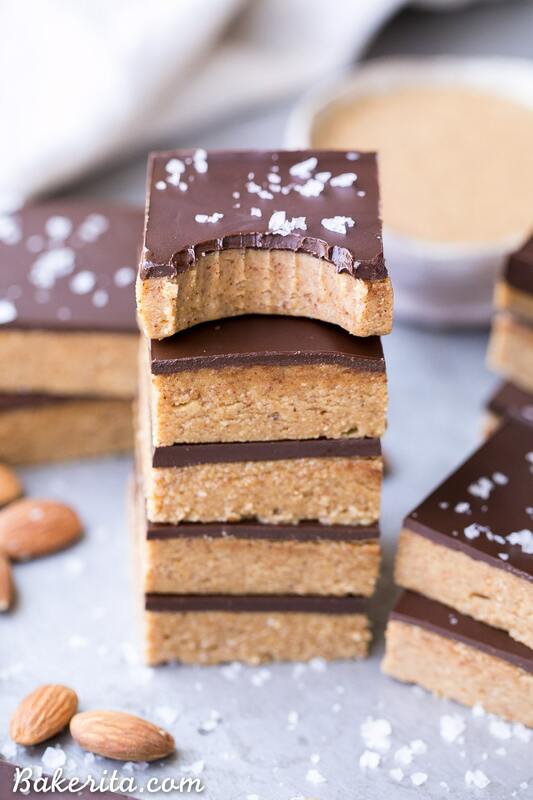 These No Bake Chocolate Almond Butter Bars are easy to make with just five ingredients and no baking necessary! 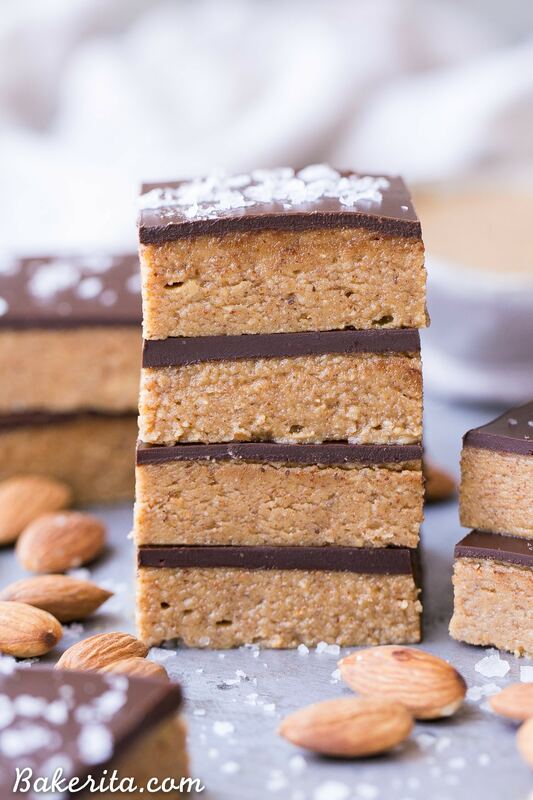 You’ve got to sink your teeth into these rich gluten free, paleo and vegan bars. Have you ever had those super thick, Reese’s-like peanut butter bars, with a thin layer of chocolate on top? They’re super rich and SUPER chocolatey, with loads of peanut butter – the way I always dreamed of a Reese’s being. They’re usually made with butter, peanut butter, and graham cracker crumbs…usually powdered sugar too. Definitely not a health food, but holy cow. They’re so good. I used to make them all the time back in high school, always to rave reviews and big smiley faces. 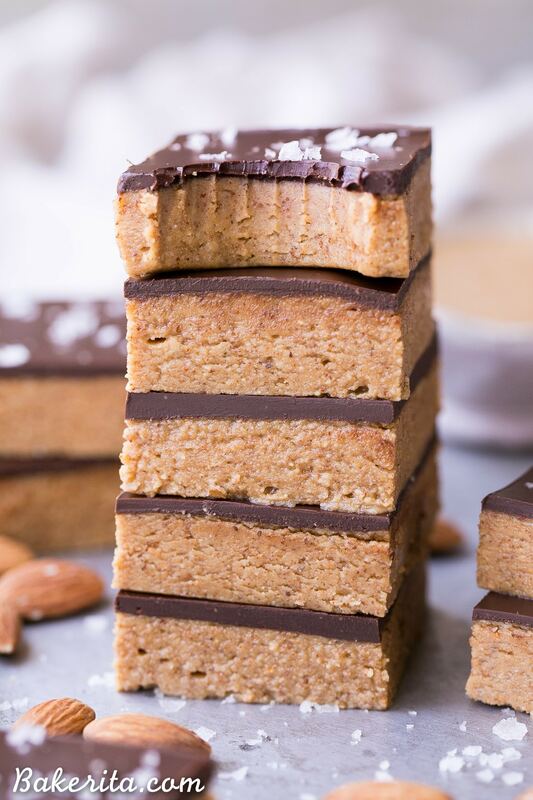 Well, these No Bake Chocolate Almond Butter Bars are pretty much the healthy almond butter version of those bars, and they are JUST as smile inducing as the originals. They couldn’t be simpler to make either, especially considering there is NO baking required, which makes it perfect for the summer months when we can’t bear to even look towards the oven. Just a few simple steps and a brief stint in the fridge to stint and these bars will be ready to be devoured. Only five ingredients necessary! Obviously, the first and most important is almond butter. I like creamy, but if you want crunchy bits, go ahead with crunchy. I’ll also note that most nut butters would work here – use peanut butter for something more like the classic, or even go for pecan butter or cashew butter. Just make sure whatever you’re using is 100% nuts – no weird additives or sweeteners please. I used maple syrup to sweeten, but honey or agave would also do the trick if you prefer the flavor of one to the others. Coconut oil helps hold the bars together after they’re chilled, and I like using refined coconut oil here. Refined coconut oil doesn’t have any coconut flavor, so it lets the almond butter flavor really shine. 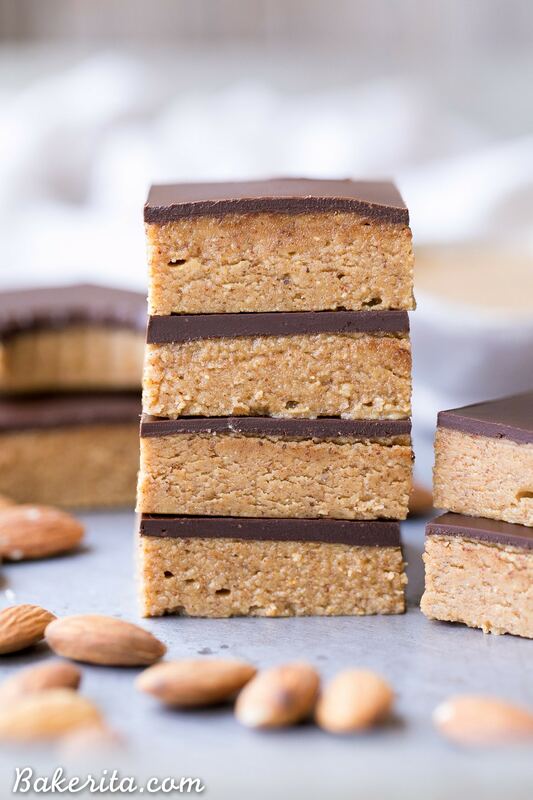 Coconut flour is also in the base – it helps gives the bars that Reese’s-like texture that graham cracker crumbs replicate in the original recipe and gives the bars a nice bite. On top of the base is chocolate, of course. It’s melted with a little more almond butter, which helps the chocolate stay soft even after it’s cooled, so it doesn’t get brittle. Spread chocolate almond butter all over everything with this Chocolate Coconut Almond Butter! You only need FIVE ingredients to make these Flourless Chocolate Chip Almond Butter Cookies. Chocolate and almond butter for breakfast?! Yes please – try this Almond Chocolate Coconut Smoothie Bowl. These super easy Paleo and vegan Chocolate Almond Butter Thumbprint Cookies will become a staple in your house. Line a 8x8” pan with parchment paper and grease lightly with coconut oil; set aside. In a mixing bowl, stir together the almond butter, maple syrup, coconut flour, coconut oil and salt. Press evenly into the prepared pan. Place in the fridge. Combine the dark chocolate and almond butter in a microwave-safe bowl. Microwave in 30 second increments, stirring between each, until the chocolate is melted and smooth. It took 1 minute in my microwave. Pour the chocolate over the almond butter base and spread to cover the top. Place back in the fridge. Let firm up for at least two hours before cutting into 16 bars and serving. Store any leftovers in the refrigerator for up to 2 weeks tightly sealed. My aunt makes those reese bars all the time for family gatherings and I can’t stay away! The nut butter-chocolate combo had my heart and I cannot lie. 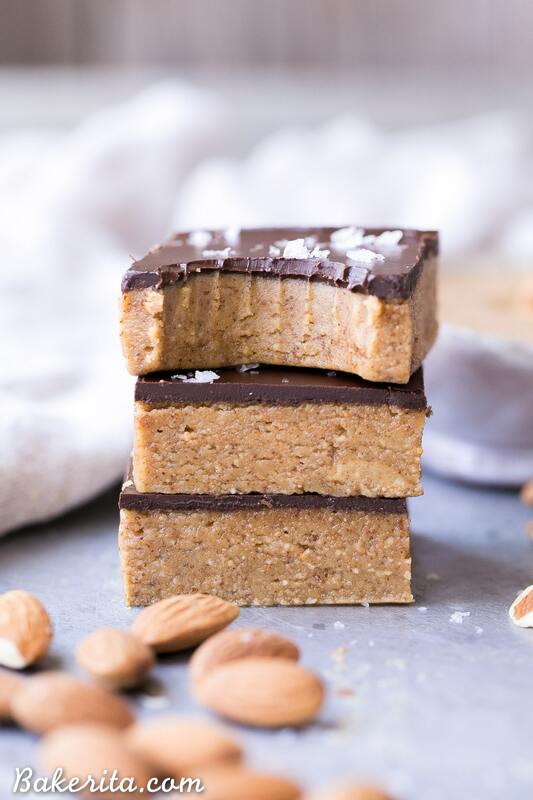 These AB ones look just are good, and probably taste even better because they have no weird ingredients! Ahhh seriously Rachel!! These look so good. And with peanut butter it would TOTALLY be like a Reese’s. Pinning! Love this recipe! Is there any way to sub the coconut flour with something? Maybe oat flour? Hi Alex, I haven’t tried it with anything except coconut flour so I can’t make any guarantees. Oat flour might work, but almond flour might be a better tasting substitute, and you may want to increase the amount to 1/3 cup since coconut flour is so absorbent. These look amazing! I made a crunchy version of these recently and was just thinking about messing around to make a creamy version :) So yum- pinning! Thanks so much Medha! They’re so tasty – I bet a crunchy version was fabulous! omigosh yesss-I love those bars but I think I might like these even more!!! My only question is…why are we not all eating these, at all times!?! They look. Incredible. These bars look so delicious! These look delish! Can you sub almond flour for coconut flour? Or would that change texture and taste? Hi Jackie, it might change the texture a little bit but I think it would still work – I haven’t tested it though. You might want to up the amount to 1/3 cup, too. How simple can it get!? These looks so good- perfect for snack time or a sweet after dinner treat! can I use butter instead of coconut oil? thx! Delicious! Can you provide me the nutritional breakdown for just the almond butter portion? This recipe looks delicious! I did have a couple of questions though. What kind of dark chocolate do you use? Also, the recipe says to mix the chocolate and almond butter together and melt—is that right or is it just supposed to be chocolate for the topping? I’m hoping to make these on vacation!!! Hi Samantha – I use Santa Barbara Chocolate coconut sugar sweetened dark chocolate. You can use the code BAKERITA for $10 off your order. And yes that is correct to mix the chocolate and almond butter together using the measurements for the chocolate topping. Do you know what (and how much) would be a good substitute for maple syrup to make it keto friendly? Hi Nicole, I don’t use sugar substitutes very often but you could use something like a sugar-free maple syrup, or even a few drops of monk fruit or stevia. Hope this helps!